Stuart's SI500 combined shaker/incubator and the SI505 model for microtitre plates are now available with IQ/OQ documentation, meeting the requirements of customers in regulated industries such as the pharmaceutical sector. Installation qualification documentation helps users to install their incubator correctly, in accordance with the manufacturer's guidelines. Issues such as location of the unit, environmental requirements and initial set-up are covered in the IQ document, with provision for all stages to be recorded for audit. Operational qualification is used to verify and document that the shaking incubator functions within the defined specifications, for example with regard to shaker and temperature parameters, and safety features. Step-by-step instructions are given for each element of the OQ protocol, including the correct use of temperature sensors and a laser tachometer. 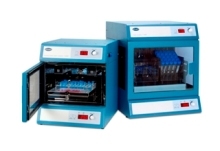 The compact benchtop Stuart® SI500 and SI505 shaking incubators have a unique retractable platform providing easy access to samples, a digital display showing the independently controlled temperature and speed, and USB connectivity for long-term monitoring of the incubator temperature via a PC. A state-of-the-art microprocessor enables accurate, reproducible control of temperature up to 60°C, and the versatile integrated timer can be set from 1 second to 9 days. Removable water reservoirs increase the humidity in the chamber of the Stuart® SI505, dramatically reducing sample evaporation. With an orbit of just 1.5mm and high maximum speed of 1,250rpm, the shaking action is optimised for mixing very small sample volumes in up to four microtitre plates or two racks of 0.2, 0.5 or 1.5ml micro tubes. The Stuart® SI500 incorporates a versatile clamping system for securing flasks of most sizes, while angle-adjustable stainless steel accessory tube racks with magnetic locking system provide quick coupling and de-coupling.